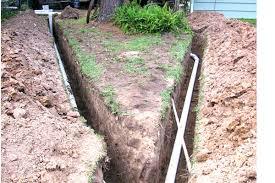 Sydney Plumbing Services » How do tree roots get into pipes? The simple method of excavating the soil with a shovel or even a mechanical excavator like a backhoe actually breaks up the soil. See the tree in our attached pic? Its root system will be able to grow through the trench looking for weakness in the pipe line. Excavations are often back filled with an aggregate like blue metal gravel. The back filled trench is never as compact as the virgin soil. It provides the roots of nearby trees a much easier path to “wander” along in their search for water and nutrients.